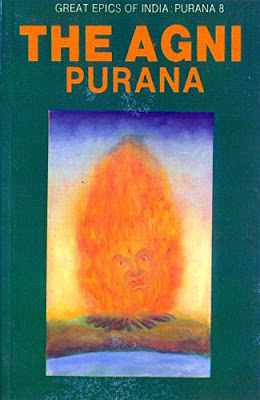 The Agni Purana does not contain many stories but has more of rituals as I mentioned before. The stories in this Purana come towards the start when they talk about the ten different avataras of Lord Vishnu. This is when my first favourite story comes, which is actually the ending of the story of the Kurma avatara. The ending is different and tells you about why a solar and lunar eclipse take place. My second favourite story is about why Gaya is a famous pilgrimage site. Though this is a Tamasika Purana, it does not actually glorify Lord Shiva the most. The rest of the Purana is also wonderful, and I will include a few snippets from the Purana. This Purana was written to help simplify the practices included in the Vedas. The Turtle: I will not talk about the whole story as it is pretty much the same as the story of the churning of the ocean that you would have heard of. We all know that the asura Rahu realized Vishnu’s deception, so he adopted the form of Chandra, the moon-god, and received the nectar, but the real Chandra and Surya, the sun-god, noticed it and told Vishnu. Vishnu sliced of Rahu’s head, but as Rahu had already drunk the nectar, he couldn’t be killed. He prayed to Vishnu, and Vishnu granted him a boon. Rahu asked for the boon that would sometimes allow Rahu to swallow Surya and Chandra, as they were the ones that complained about him. We see this is the form of a lunar and solar eclipse. Places of Pilgrimage: Gaya is said to be the holiest of all tirthas and let me explain why. Once an asura named Gayasura started to perform Tapasya. His Tapasya was so strong that it started to make the gods suffer. The gods ran to Vishnu and asked him to save them from Gayasura. Vishnu went and granted the asura the boon that he would be the holiest of all tirthas. Once Vishnu granted him that boon, the asura disappeared, but once this happened, the gods thought that Earth was too deserted without him. Vishnu instructed all the gods to go and ask Gayasura that they needed his body for a sacrifice. When the gods asked Gayasura, and as soon as he agreed his head fell off from his body. The gods then proceeded to make the sacrifice on his body, but the body started to shake. This indicated that the sacrifice was being performed wrong. They decided to place a stone on the asura’s body to make sure it was still. All the gods entered the stone along with Vishnu so that the sacrifice would be performed. Gaya is sacred as all the gods including Vishnu are always present at the spot. The purana also includes how you can identify if your dream is a good omen or a bad omen. If dream of plants growing on your body, drinking oil or eating bird’s meat, wearing shabby clothes or having a shaved head, they are bad omens. Dreams that contain snakes, palaces, mountains, being dead, someone having his head cut off or that his house is being burnt down is also a good omen. Before going on a journey, if one sees coal, cotton, dried grass, ashes, or a broken vessel, they are bad omens, and good omens are distant noises, full vessels, an elephant, sugarcane or a conch. The Purana tells you the merits of building a temple or idol, and how an idol should look. Like most Puranas, it also includes all the Manvantaras, Narakas and Varnashrama Dharma. The importance of reciting the Gayathri mantra, the rules a good king should follow, which nakshatras are good omens, and which aren’t or when should you perform a specific fast constitutes an important part of this Purana. This Purana is a supplement to the other Puranas by including rituals and Hindu beliefs and customs which do not hold a major part in the other Puranas. The Agni Purana is very holy as it gives good health, spreads happiness and ends nightmares. Listening to the recital of the Purana, reading a chapter, or organizing a recital of this Purana brings a lot of Punya that is greater than visiting any pilgrimage center. Your sins will also be forgiven if any of this is followed. Ghosts, enemies and thieves do not visit the house where the Agni Purana is kept. A brahmana who listens to the recital of this Purana becomes learned in the Vedas, a kshatriya who does so becomes the ruler of the world, a Vaishya who follows this becomes rich, and a shudra who listens to the recital acquires good health.